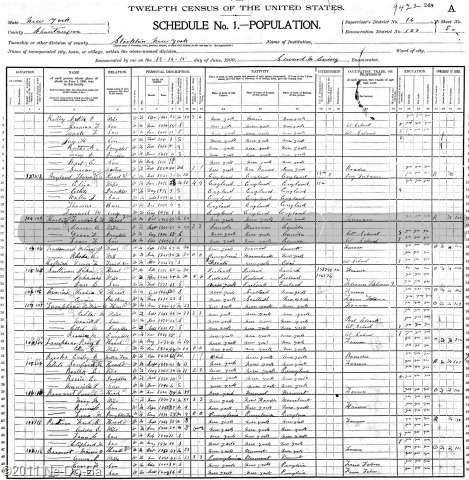 Carrie Horton and her family are still in Stockton for the 1900 Census. 1900 U.S. Census, Stockton, Chautauqua Co., NY, pg. 5, dated 13-14-15 of June, 1900. Frederick H., Horton, head, white, male, b. Oct.1852, age 47, married 20 years, he and both parents b. NY, farmer, he can read, write, & speak English, he rents his farm. Carrie A. Horton, wife, white, female, b. Sep-1857, age 42, married 20 years, has given birth to 3 children all still living, she and her mother born in Canada, her father born in Wisconsin, she can read, write, & speak English. Grace L. Horton, daughter, white female, b. Aug-1884, age 15, b. NY, currently attending school, she can read, write, & speak English. Leon F. Horton, son, white, male, b. Apr-1887, age 13, b. NY, currently at school, he can read, write, & speak English. It appears the oldest daughter is living elsewhere. Perhaps she is married or working away from home. Once again, Carrie says she is born in Canada. This year she also says her mother was born in Canada. Now, I was surprised to see her claim that her father was born in Wisconsin. I wonder where that comes from?